Yes, I know I'm in the middle of showing you a series of cards made with Stampin' Up's Something for Baby stamp set but then I saw this week's fantastic colour palette and inspiration photo at the ColourQ and had a sudden idea for something bright and fun! 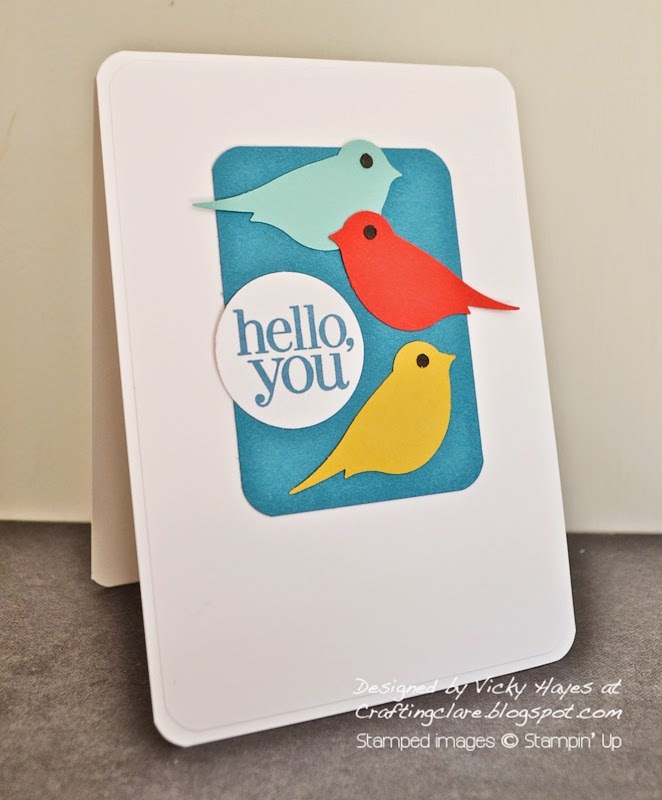 Stampin' Up's brilliant bird punch is very popular - and quite right too! I love this shape of bird and you also get wings and a little branch (not used here today) which are really useful to use as leaves with die-cut or punched flowers. I punched the birds out of Coastal Cabana, Hello Honey and Real Red and arranged them on a background of Island Indigo card stock. This bold sentiment from Regarding Dahlias suits the graphic style of the card and it cuts out neatly with the 1 3/8" circle punch. I curved all the corners on my card. Our cat Tuppence used to sit on the window sill and wind herself up watching the other cats in the neighbourhood until, in exasperation, I arranged some of my little wooden birds there. She still tried to jump up though, sometimes managing to squeeze herself into the tiny gap between the window and the birds! "No, Tuppence," I'd say, lifting her down. "The birds - they say no!" Perhaps that's why she's practically left home... She only comes in to be fed now, allows herself to be cuddled briefly and then shoots off through the cat flap - and if we close the cat flap, she meows the place down. We have been told! This is so cute Vicky! I hope you have a great weekend! Just had to pop in to say how much I love this, Vicky. Great idea, so bright and cheerful. Hope you are well and enjoying our seasonally warm summertime! What a really fun card, Vicky, love what you did with the colors! So happy to see you at the colourQ, thanks for playing this week. Great way to use the bird punch Vicky - it looks so effective, especially in those bright colours. 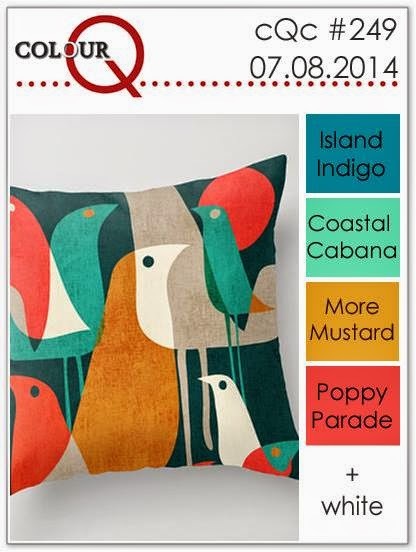 Thanks for playing along at Colour Q! Oh! I agree, a fabulous combination of colours and your card has definitely shown them, fab card, so bright and summery.